And one would be wrong. At first glance, this might appear to be a finished sweater (apart from the unfinished grafting under the arms) and technically, it fits. I waited until I had finished the neckline and cast off to try it on for the first time, expecting a roomy, almost boxy feel, and instead it is quite fitted, to the point of being body-hugging. At certain angles with careful layering and maybe if I were a little happier with my figure at present, it could work, but I wanted a cozy, smooshy, decadently textured and cabled sweater, not something clingy and short that can only be worn with Spandex underneath. 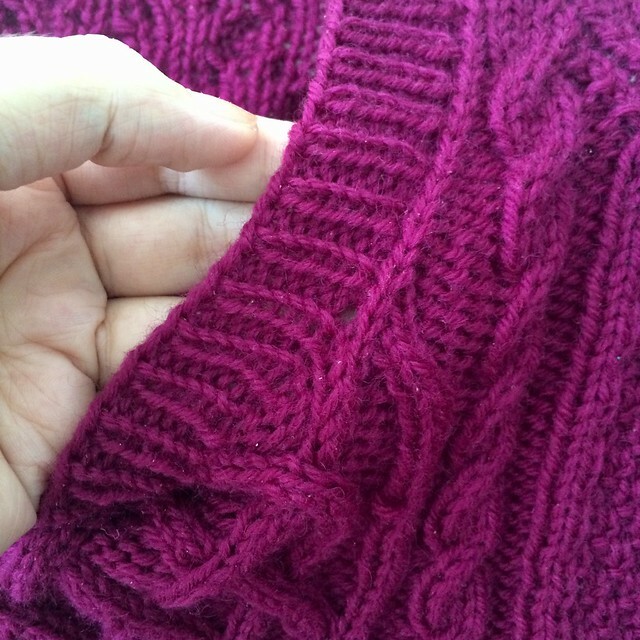 The little holes from careless neckline pick-ups block out, right?? My gauge, once I finally checked it, was way off, something like 5 stitches/inch instead of 3.8, which makes perfect sense, as this sweater is about 25% smaller than I expected it would be. I briefly tried to convince myself it would stretch a lot in blocking and end up at the expected dimensions, which it might, but since I have more than 5 balls of yarn leftover and this wasn’t exactly a quick project, there is no reason to compromise. No, raglan decrease gaps don’t bother me at alllll….. The closer I scrutinized it, the more flaws I started to find as well. I wasn’t happy with the gaps introduced by careless pick-ups for the neckline, but I was willing to sew them shut by weaving in some reinforcing threads. Ditto for the gaps made by raglan decreases along the shoulders, which probably wouldn’t have been so visible if the shoulders weren’t stretched as much. And weird decreases on the sleeves are just par for the course, right? I know I would not be happy with this sweater as it is. 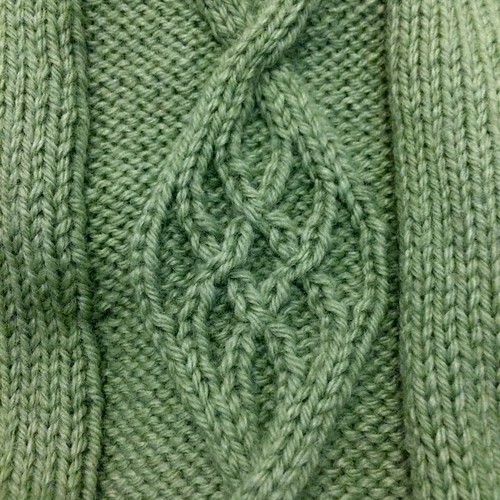 I am a better knitter than this, and I care about these details too much to let them slide. The time I spent pretending I didn’t care or that, “It’ll all block out!” was “expensive” in knitting terms, but very valuable lessons. This sweater taught me how to make a seamless yoked sweater in pattern (way easier than I thought it would be). I also learned how important it is to track rows in moss stitch, after the first large frogging-and-restarting. And now I’ve learned, for real, to actually check my gauge and not just follow the pattern blindly, hoping it’ll all work out. 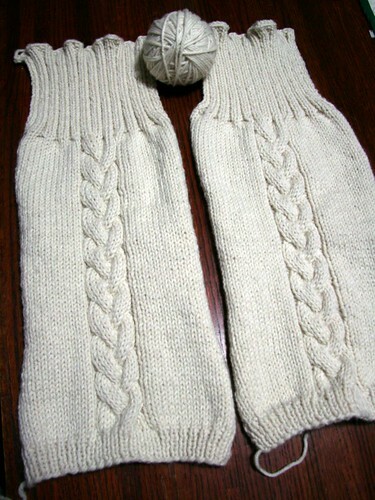 As this was knit with size 6 and 8 needles, I expect 8/10 will do the trick, so long as the pattern holds up. I also plan to make some adjustments with things I didn’t like, such as making a better plan for incorporating sleeve increases in moss stitch, inserting a filler stitch to absorb the raglan decreases on the sleeves, and learning how to pick up neckline stitches more neatly so I don’t end up with gaps. This project has been like a security blanket for when I needed comfort or an escape from reality, and I mean it when I say it’s been a true pleasure to knit, so I don’t mind starting over to get something wearable with the right finishing details. Let’s hope I’ve actually learned my lessons this time. When I first started knitting, documenting every stage of the project and its progress was almost as important to me as the actual stitches. As life grew more complex, I became complacent about knit-blogging (perhaps you’ve noticed) and considered it quite a feat if I got the cursory details slapped up on Ravelry, let alone took a photo. I’d like for that tendency to change, and I’m giving myself permission to enjoy this part of the process again too. During a lengthy stay at my parents’ house this winter, I was buying new yarn for a pair of socks I’m knitting for my brother when I had an irresistible hankering to knit a sweater. 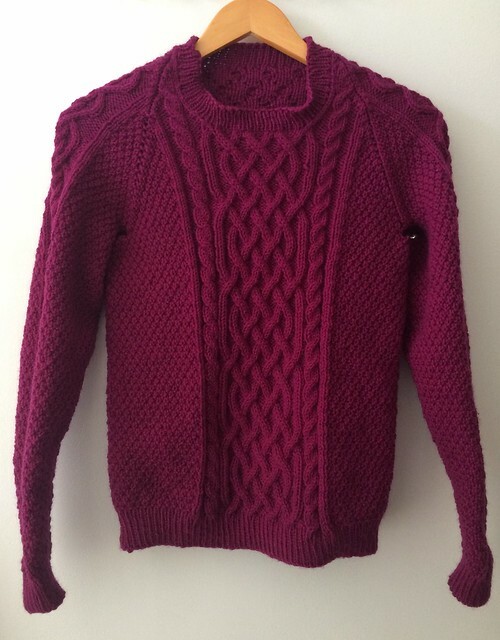 Drawn in by the allure of free shipping and a Valentine’s Day sale that made this yarn shockingly affordable, I found a pattern for the Olwen Sweater, a beautiful seamless cabled pullover with a lovely yoked raglan-sleeve construction. 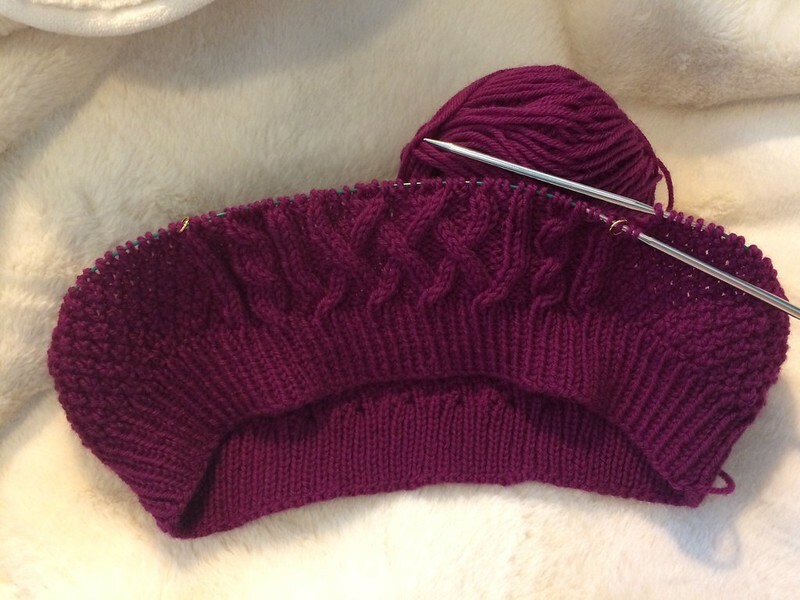 In a cushy worsted-weight yarn, with this delectable purply-magenta color, it has been an absolute delight. When I got back to my apartment in April, I found a few places where I’d flubbed the pattern (I started it when I had a fever, after all), so I ripped back to the ribbing, and it’s been smooth sailing since. I’m now past yoking the sleeves to the body, which was way easier than I’ve always imagined it would be, and I’m cruising toward the finish just in time for what promises to be a sweltering hot summer. Fortunately, this sweater is in a style, color, and quality I foresee myself enjoying for many years to come, so it will keep. 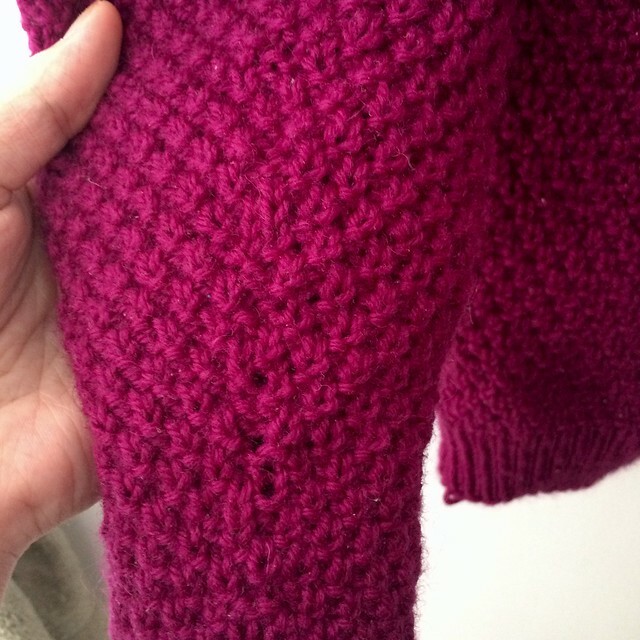 As I was returning to the shore this Memorial Day weekend, it seemed impractical to try to squeeze a nearly-finished wool sweater into the already overstuffed backpack I was bringing, so I tried to think of a good traveling project. I landed on a new cast-on for Kieran Foley’s Seascape Stole, a gorgeous undulating pattern that’s been tempting me since it was published in the summer 2008 Knitty, and for which I’ve had this yarn earmarked since June of 2009 (yikes – that feels like it just happened). As I am working it on a 16-inch circular needle and only using one page of the chart from the 2015 revised version, this project currently fits in a small sandwich bag, making it ultra portable and quite a pleasure to knit on the go. I hope to share a lot more this summer, as I am coming back to the surface in many areas of my life. The Cable-Down Raglan is precipitating that moment for me now. I’ve tried knitting this sweater two other times when I wasn’t really ready. 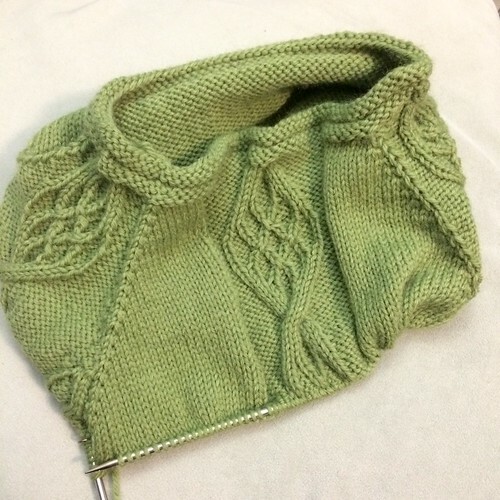 The first time I was still a fairly green knitter and couldn’t even make sense of the pattern. The second time I started it as a gift, but I flubbed the cables and realized I still wasn’t ready yet. Not this time. Now I am ready, and hey, I’m getting pretty good at this. I’ve finished enough sweaters to understand the construction, I’ve followed enough charts and cabled enough things that I know how to do it correctly, and I’ve even worked with enough yarns to know this one is a really good fit for this project. I’m excited to see how this one comes out. For a while now, I’ve been trying to bring legwarmers back. These make me so glad I did. 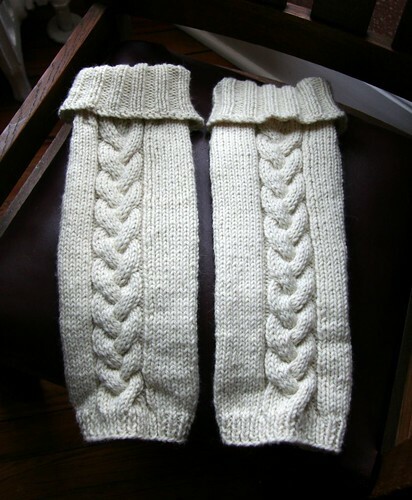 I started knitting in part because I wanted so badly to make myself a pair of legwarmers. They are such a perfect item for frigid cold weather like we’ve been experiencing lately, and they make it that I can actually stay warmer wearing skirts and dress shoes than if I wore pants. This pattern is fast, fun, and intuitive. You knit them flat on straights, which I think makes it go a little faster, and it avoided issues with ladders like I usually get when working at a large gauge in the round. One seam up the back et voilà, legwarmers! I was nervous about the cables, but they were much easier than I anticipated. I love the plaited look of them, and they were actually really fun to do. 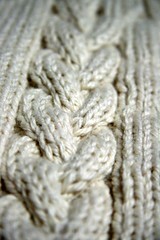 In this yarn, they are so squishy and sculptural, and they make an elegant, but strong statement. 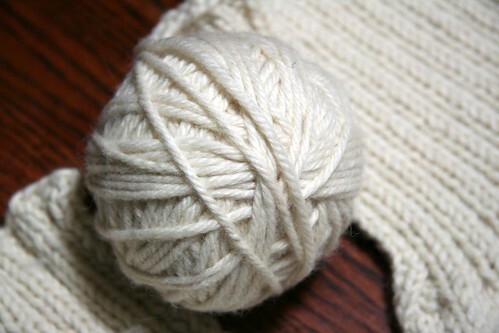 I feel as though I should write a love letter to this yarn. I bought it several years ago to make a capelet that looked disastrous on me. When I found this pattern, I was thrilled, as it was a much more suitable use of such warm, snuggly, thick, and crazy soft yarn. This is actually a slightly heavier yarn than the pattern called for, but it was a nominal difference which makes them roomy enough on my ankles to pull down over my shoes, but still fitted enough to stay up at my calves and knees. The top ribbing is just long enough to pull over my knees on really cold days, but perfect if I fold them over as shown. 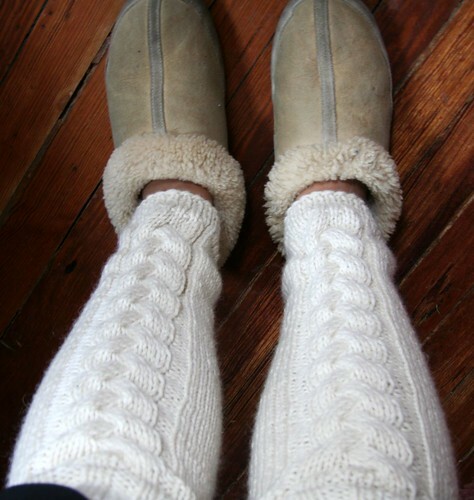 These are so cozy that I don’t just wear them when I want to be stylishly warm out in public. In fact most often, I wear them around the house with slippers. My legs have never been happier. 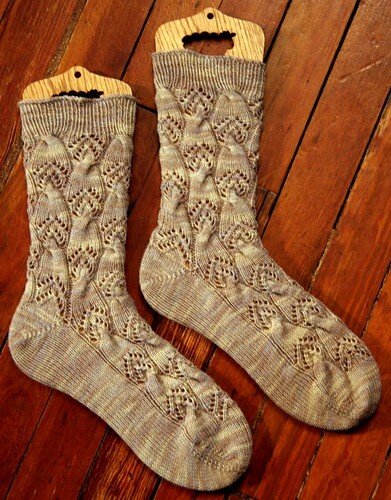 I neglected to even mention that I was working on these, but I finished a pair of Komet socks this week. These are like no socks I’ve knit before. 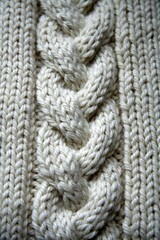 This isn’t exactly a formal theory, but I think a knitter is either a lace person or a cable person. 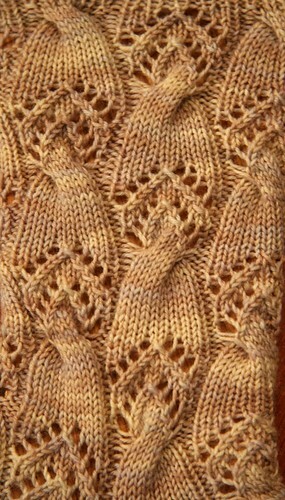 I would have considered myself firmly in the lace camp, as I gravitate toward open, flat patterns with simple repeats. 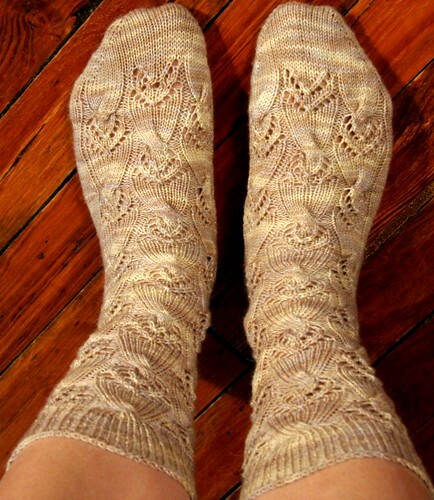 Then I got hooked on these socks, which have both cables and lace, and I couldn’t decide which section I enjoyed more. Fortunately they were worked simultaneously, so I got to indulge in both. 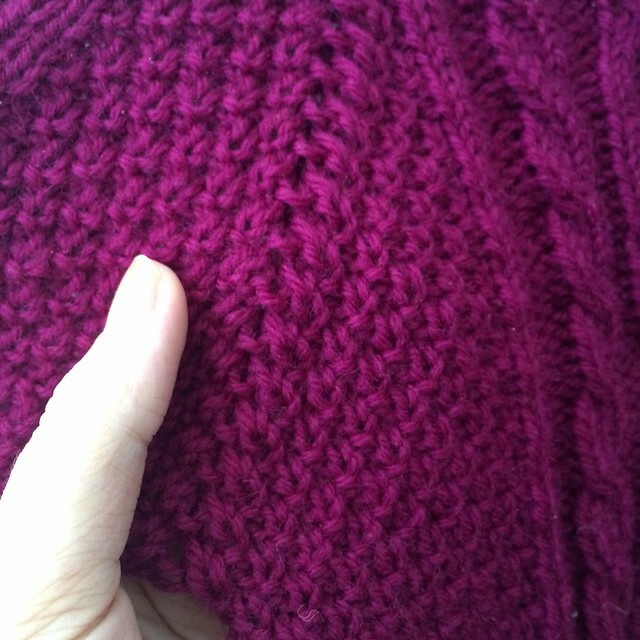 While I have cabled in the past, I didn’t really love it the way I love lace, but this time the cables clicked for me. The maneuvers finally made sense, and I looked forward to the crossings, which thankfully only occurred every 14 rows. 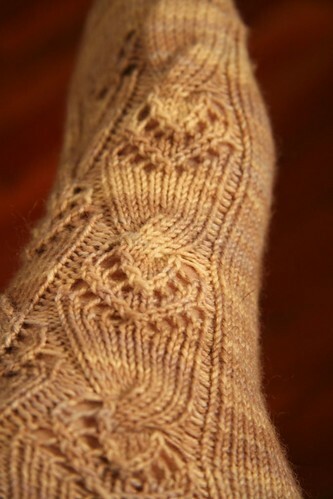 By the time I got past the heel on the first sock, I’d memorized the pattern, and I really enjoyed working from memory. This was, though, one of my first times working a pattern purely from a chart, without writing it out for myself, and it went a lot more smoothly than I expected. The yarn was delightful, as I’ve come to expect from Regia. I bought a lot of colors of this particular yarn from WEBS close-outs, and it’s a truly fantastic go-to yarn. This color seemed an anomaly among my typical choices, in that it is so subdued, with such subtle variations within a gentle range of tones. 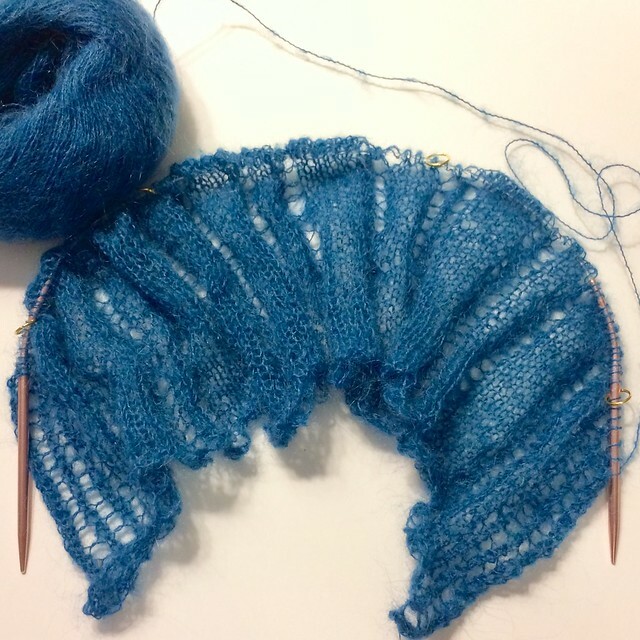 It ended up being a perfect counterpoint to the architectural quality of the cables and lace pattern, providing visual interest and delicate movement without distracting at all from the stitching. I hope it’s not immodest to say I think these socks are beautiful. I would definitely recommend this pattern. It was very intuitive, enjoyable, and I think the outcome is great. The fit on these socks is fabulous, and all in all I just couldn’t be happier with them. It figures that I waited until the rainiest, darkest day of November to photograph them, but they are much nicer in person. Now that I’ve gotten my (probably) last selfish project off the needles, I must concentrate in earnest on gift knitting for the rest of the year. I’ll just have to admire my feet while I do it! © 2008 Moon - All Rights Reserved.